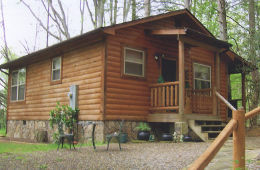 Spend your Smoky Mountain vacation in a private, pet-friendly, rental cabin nestled in Cosby, Tennessee, on eight secluded acres bordering the great Smoky Mountain National Park with a large mountain creek at an affordable price to fit any budget. Just 20 minutes from Gatlinburg, TN, and one hour to Ashville, NC, dining, shopping, hiking, fishing, bird watching, biking, white-water rafting, scenic drives, and horseback riding are all within minutes. 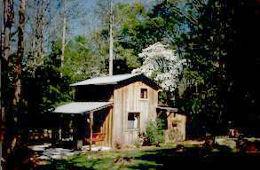 Two bedroom, exquisitely furnished log cabin with porch overlooking a creek. 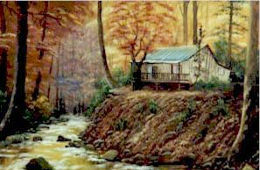 Two bedroom cottage with a great view of the creek and into the National Park. 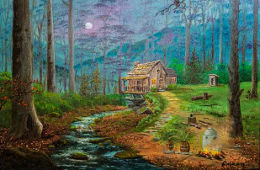 Cute, cozy, secluded cabin with an attic bedroom. Close to the creek. 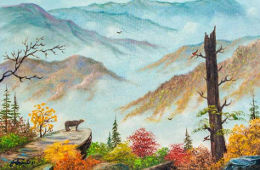 Iva Prince, owner, is a well-known artist of the Smokies, who paints oil landscapes of the area and her property. She has a home studio and gallery on the property, and you can sometimes watch her at work.